Hello! I have some forms with fields to attach photographs on my website. I realized recently that when you fill in all the fields, add the photographs and give them to submit, the form is left loading the images in the upper right. The problem is that the user does not see it and thinks that it has been sent or just the opposite that does not work and closes the web. 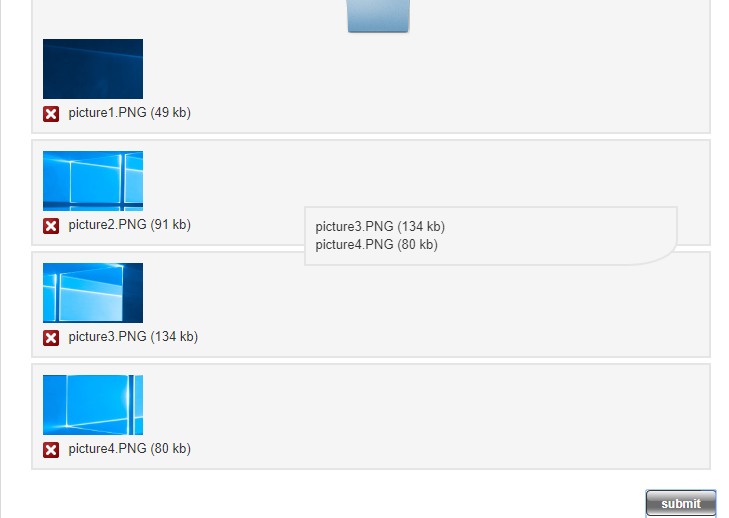 How can I change this so that when the user submit it to see the list where the images are loaded or in the same space where the list of images is displayed, the upload bar is displayed. Please try to preview the form in backend and let me know whether then this appears. Hi! I tried and doesn't show like your screen shots. I attach two screenshots. It shows the loading bar at the top right and if the user does not move upwards it does not know if the images have been loaded. I assume that is according to the template that you are using. Can you please try to add a piece of code to your form that would make the page scroll to the top after submit button is clicked so that user sees that pictures are loading. Go to form's Advanced properties > More options > Form pieces and in Before Form section set Type to Custom. Let me know whether you have managed to apply this to your form and whether it works as you wanted. Hi! thank you so much. Now the user can see the upload list. How can I change the message "Files submited sending data now. Please don't abort." I have a spanish website and I want to put something similar but in spanish. To translate the message "Files submitted sending data now. Please don't abort." please do as follows. Instead of en-GB will be your language shortcode. COM_BREEZINGFORMS_SUBMIT_MESSAGE="Files submitted, sending form data now. Please do not abort!" 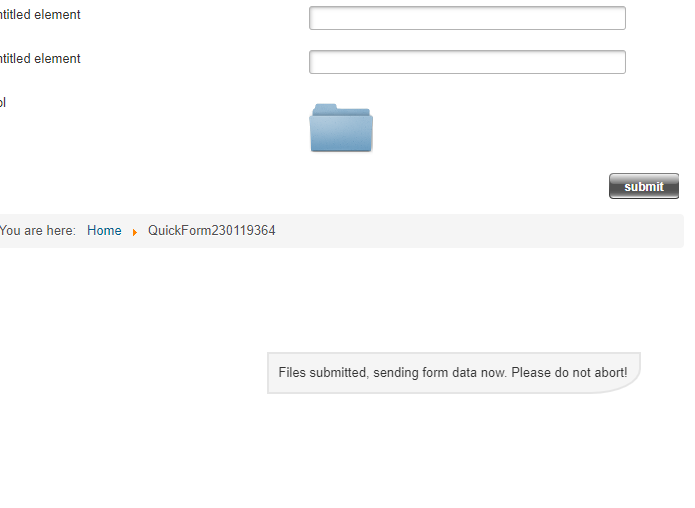 Put here the message that you wish to display when submitting the form. Don't forget to save the change.